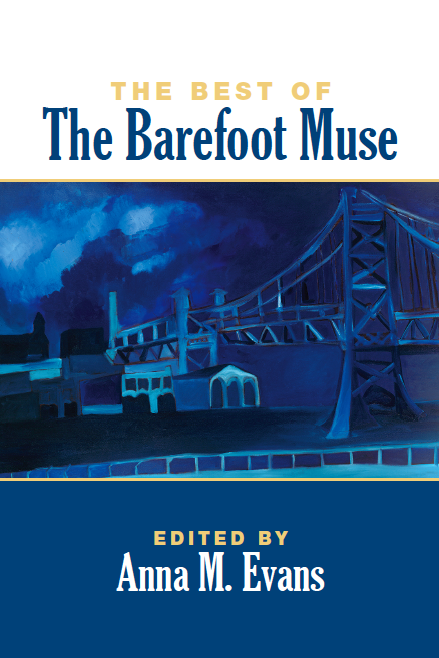 THE BEST OF THE BAREFOOT MUSE POETRY ANTHOLOGY: AVAILABLE IN TIME FOR CHRISTMAS! More than sixty poems from over fifty poets including Kim Bridgford, Robert W. Crawford, Erica Dawson, Jehanne Dubrow, Annie Finch, Paul Hostovsky, A.M. Juster, Susan McLean, Aaron Poochigian, Jennifer Reeser, David J. Rothman and Gail White. Contemporary examples of the sonnet, the villanelle, the triolet and the sestina take their place in the anthology, alongside more unusual forms such as the ghazal and the fib, as well as many poems in structures of the poet's own devising. "The Barefoot Muse did not publish free verse," explained Evans, "But that still allows for a huge amount of variety." The cover art, a painting of the Ben Franklin Bridge, was provided by Philadelphia-area artist Erin McGee Ferrell, and the cover was designed by Burt Myers. In 2012, Evans plans to run a chapbook contest for short collections that demonstrate a strong connection to formal/metrical poetry. Barefoot Muse Press was established in October 2011 as a quality small press devoted to furthering the distribution of the best formal and metrical poetry. It can be found on the web at barefootmuse.com and on Facebook at www.facebook.com/BarefootMusePress.